V.21 fax channel 2 software is available as as a real-time implementation with support for multichannel applications. 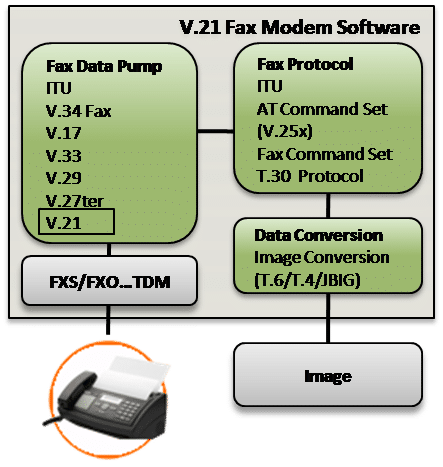 The V.21 fax software libraries are modular and can be executed by developers as a single task under a variety of operating systems or standalone with its own microkernel. Contact us to discuss your fax software application requirements. VOCAL’s V.21 channel 2 fax software is optimized for leading DSPs from ADI, ARM, Intel, TI and other vendors. The V.21 channel 2 algorithm is available standalone, as part of an embedded library, or with a VoIP stack. Our V.21 fax software may be licensed standalone, as a library or complete design with custom solutions available for your specific requirements. ITU-T V.21 recommendation defines the modulation methods and operating sequences for a 300 bps duplex fax modem designed for use on connections set up by switching in the general telephone network. V.21 is meant for data transmission at a low data signalling rate, such that data could be transmitted over a telephone circuit operated alternatively for telephone calls and data transmissions. For V.21 channel 2 fax, the nominal mean frequency is 1750 Hz. Software developers can control all of the V.21 channel 2 facsimile modulations and data streams with VOCAL’s T.30 library or with VOCAL’s facsimile service Class 1 Command Set (EIA-578 and T.31). The T.30 library could in turn be controlled by our facsimile service Class 2 Command Sets T.32 (Fax Class 2.1), EIA-592 (Fax Class 2.0), or industry standard (Facsimile Class 2). With Fax Class 1, most of the protocol is executed in software, with the advantage that any changes don’t require hardware modifications. This is in contrast to Fax Class 2, where image processing is handled by the modem. The line interface may be an analog front end (codec and DAA) or a digital interface such as T1/E1, Switched 56, and ISDN. The upper end of this software offers a direct binary and HDLC interface. System can be combined with V.34 fax modulations and startup procedures (V.8 and V.8bis). VOCAL’s optimized fax software is available for the following platforms. Please contact us for specific V.21 channel 2 fax supported platforms.